If 2018 was the year of digital washing, then 2019 is the year of digital scale — of moving faster and more systematically. There is no endpoint to digital transformation and strategy. Despite best intentions, many organizations are stuck modernizing small pieces of their business instead of critical platforms and functions. If 2018 was the year of digital washing, then 2019 is the year of digital scale — of moving faster and more systematically, according to Dan Hushon, CTO at DXC Technology. Setting out on their digital transformation journey, many organizations failed to pick a point far enough ahead on the horizon. They reach the goal laid out, but then look around and realize it wasn't enough to have a digital "sidecar" or product; they still need reinvention with data at the center of the business, Hushon said, in an interview with CIO Dive. More companies are describing themselves as platform companies, but they "always run the risk of building a field of dreams that the business units can't wait for or don't feel that they were a part of," Hushon said. Systemic change needs technology that anchors business platforms to harness data and information to drive digital products, services and experiences. With benefits of digital transformation streaming in already, more organizations are planning to ramp up investment and digitally enable greater portions of their business. But funding, culture and the right motivations have to materialize first. A company can't compete today without a digital strategy, especially with digitally native and innovative companies on the prowl for more market share. Businesses need to get out of the growth versus cost mindset, according to Richard Davies, managing director at Leading Edge Forum and digital general manager at DXC Technology, in an interview with CIO Dive. Changing technology, moving to SaaS or cutting costs is not the same as fundamentally rebuilding technologies to create new business platforms — the core of an effective transformation. Business leaders tend to frame digital as creating growth, while functional leaders such as the CIO tend to frame it more in the lens of productivity increases, according to Hushon, referencing a survey by The Economist Intelligence Unit and DXC Technology of more than 600 senior executives across global companies valued at $500 million to $5 billion. 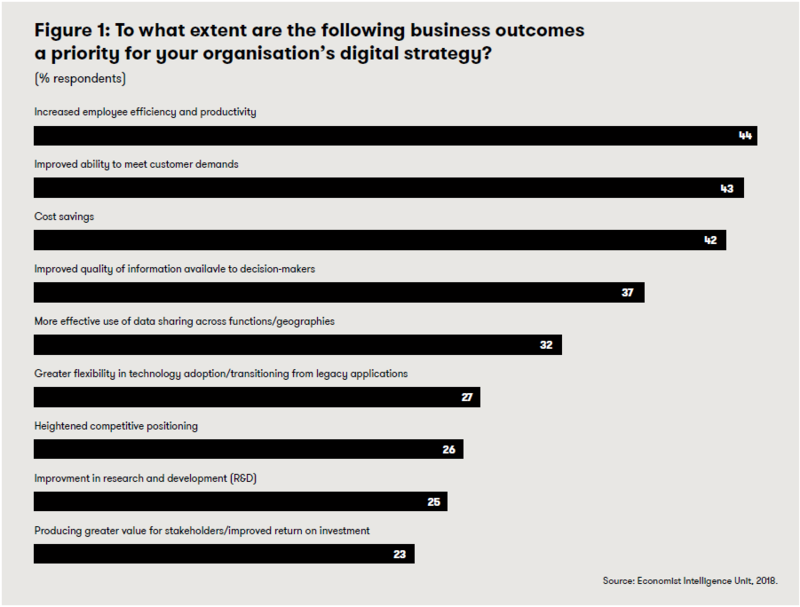 Hushon was surprised to find only 26% of respondents reported heightened competitive position as a business outcome priority of their digital strategy. Improvements in efficiency and productivity, meeting customer demands and cost savings took the top three spots, nabbing 44%-42% of respondents. With improvements in efficiency and productivity, more businesses are actually expecting growth from their digital strategy. Just over half of survey respondents, 52%, reported digitally enabling just three key organizational functions, the survey said. Digging into why, many respondents point to funding as the reason for limited scope of transformation thus far. But business are finding that digital transformation is profitable. More than two-thirds of survey respondents found annual profitability increased as a result of digital strategy over the last three years. And almost three-quarters expect it to increase in the next three years too. For a company like DXC, the bet on the marketplace is that digital transformation is creating enough profit that they can operate a company's existing environment and return proceeds to fund transformation of even more business functions, Hushon said. Transform, save money, then invest to do more. Mid- and back-office transformations can take longer and receive less funding, stymieing the ability to act as an accelerator for the rest of the business. But overall, companies are indicating more investment in their digital transformation efforts, with 68% of respondents expecting more investment in digital technologies this year. More than 40% expect increases of 11% or more. Like many other industry research reports, DXC's survey found a greater focus on corporate culture emerging this year. Extending transformation past the technology level to organizational structure is crucial, according to Davies. This can take many forms, from breaking down information silos to reorganizing departments. Culture is pivotal to the success of digital transformation, and technology leaders such as CIOs are increasingly responsible for setting it in their organizations. Traditional, especially 20th century, companies tend to struggle more realizing culture than their digitally native, younger competitors. Many organizations are struggling to acquire the necessary digital skills for their transformation through organic means, a process that hinders culture reform, according to Hushon. But shifts in technology are meeting the changing skill dynamics. Companies such as Microsoft, Amazon and Salesforce are building platforms that lower the skill and knowledge barriers to building a business capability, he said. This enables tools for citizen developers who help their business unit become more productive by building its workflows, especially through drag-and-drop and other low code capabilities. There is also a reorientation to the cloud not just to save money operationally, but to change the skill threshold and availability. Core digital technologies can help unlock the talent willing to work with an organization, Hushon said. Correction: This piece has been updated with Richard Davies' title.